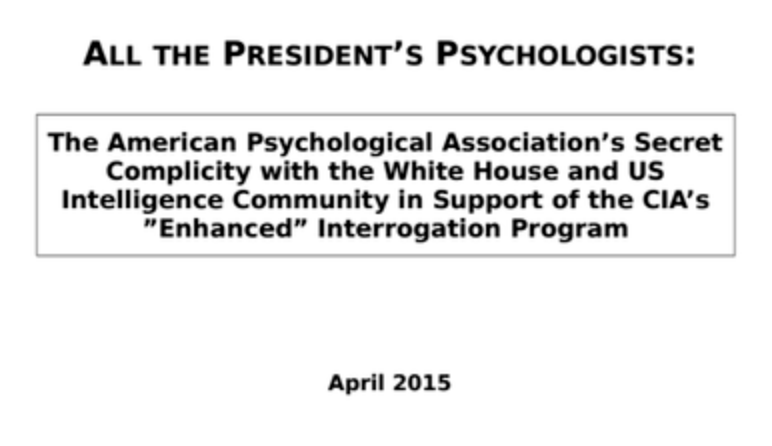 When officials representing the Ethics Committee and Board of the American Psychological Association announced in 2005 that it was ethical for psychologists to assist detainee interrogations, they set off a decade of protest from APA members and health and human rights organizations. Psychologists in groups such as withholdAPAdues, Psychologists for Social Responsibility, and the Coalition for an Ethical Psychology supported debates, protests, petitions. How could the largest psychology association in the world support psychologists working in interrogations rife with torture and abuse? With the help of investigative journalists and anti-torture activists from Physicians for Human Rights, “dissident” psychologists investigated the secret origins of the policy and unmasked the APA officials responsible. By Stephen Soldz, Nathaniel Raymond and Steven Reisner. At a 2008 conference presentation, Dr. Summers explained how the American Psychological Association (APA) developed strong ties to the U.S. military, the Veterans Administration, and U.S. intelligence agencies. There was a great demand for psychologists in World War II to test and screen recruits and to develop Psy Ops for the allied propaganda effort. Psychologists made a major contribution to the war effort in several ways, “not all of which we can be proud of, but some of which we can be very proud as psychologists.” Dr. Summers described how the Veterans’ Administration became vital to internship training and clinical practice for psychologists. He also traced the history of funding by the CIA and other government agencies for psychological research of potential value to counter-intelligence operations. Read more on Summers’ history of the APA.